Background: 2,5-Diketopiperazine derivatives are considered to be an important classe of cyclic peptides due to their wide range of biological activities. Objectives: Synthesis of a new series of protected 2,5-diketopiperazine derivatives and evaluation of their in vitro biological activities. Methods: A series of new mono-protected arylidene 2,5-diketopiperazine derivatives 3a-p have been prepared via Claisen-Schmidt condensation of the N,N-diacetyl-diketopiperazine 1 with a series of substituted arylaldehydes. All prepared compounds were characterized by 1D and 2D 1H/13C NMR and ESI-HRMS, and screened for their in vitro acetylcholenesterase, xanthine oxidase and α-amylase inhibition and cytotoxic (HCT-116, MCF-7 and OVCAR-3) activity. Results: Among these compounds, the greatest activity against the α-amylase enzyme (percentage of inhibition (PI)=57.8±1.9%) was obtained for compound 3f bearing a phenoxy moiety. 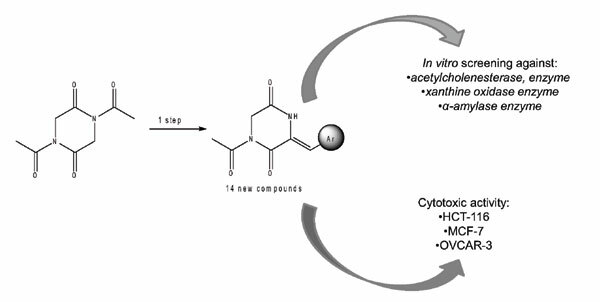 Moreover, the results demonstrated that some arylidene 2,5-diketopiperazines 3 exhibited significant cytotoxic activity against the three cell lines used. The compound 3g (4-PhCH2O.Ph) was found to be the most cytotoxic against the HCT-116, MCF-7 and OVCAR-3 cell lines (PI=83.2±2.4, 89.6±4.9 and 74.4±5.2%, respectively) followed by 3m (2-Br-5-F.Ph) then 3j (4-C2H5-3-NO2.Ph) which displayed a good cytotoxic potential against OVCAR-3 (PI=77.0±2.1 and 71.4±0.9%, respectively). Conclusion: A series of sixteen new arylidene diketopiperazines 3a-p were synthesized via Claisen-Schmidt condensation. Most of the piperazines 3a-p exhibited a good cytotoxic and antidiabetic effects. Synthesis, 2, 5-diketopiperazines, Claisen-Schmidt reaction, anti-acetylcholinesterase, anti-xanthine oxidase, anti-α- amylase, cytotoxic activity.